Neon tube bender Ken Hines delicately blows into a raw piece of glass as he bends it into what will soon be a new neon creation. Blowing and bending glass tubes his whole working life, Ken Hines has helped illuminate the Reno skyline for nearly forty years by creating countless neon signs, but his workload has dwindled and craftsman like him are fading away, like the neon they create. KUNR’s Holly Hutchings caught up with Hines at his work station at Artech, a coworking space in Reno, and has his story. The last full-time neon tube bender in Northern Nevada--that’s what Ken Hines calls himself. He says there are some part-timers who create signs or do repairs, but that he’s the last of his kind in the region. The job is in his blood, as his father also worked in neon. Hines learned the craft from his dad, seeing him do the work from the time he was just five years old. Hines says his dad encouraged him to go into the trade, claiming it was his destiny. It took him nearly seven years to feel fully confident in it, with the bending, the pumping, the patterns, blocking the tubes out and maintaining the pumping manifold and equipment--all without breaking glass. He began in 1982 and has been doing it ever since. 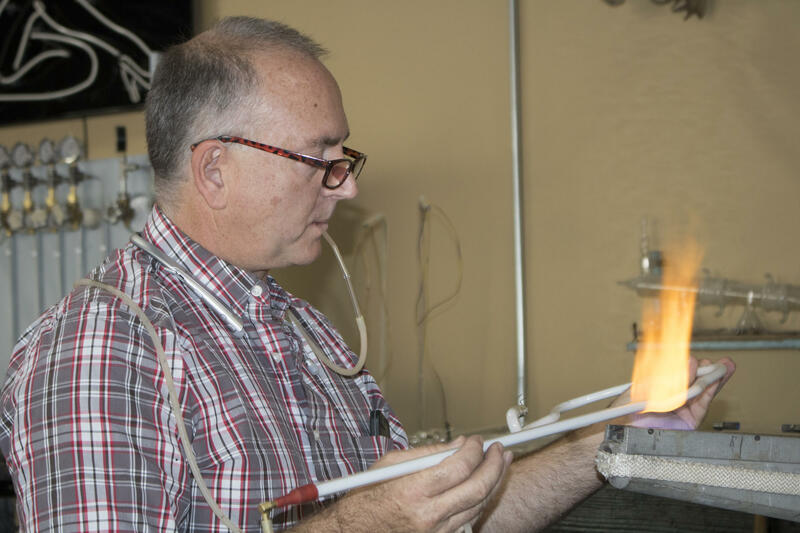 Neon craftsman Ken Hines slides a glass tube back and forth over a tall flame. Heating the soft glass is important in neon production to get the tubes to bend into different shapes without breaking. Hines has seen the changes to his business in his decades of experience. 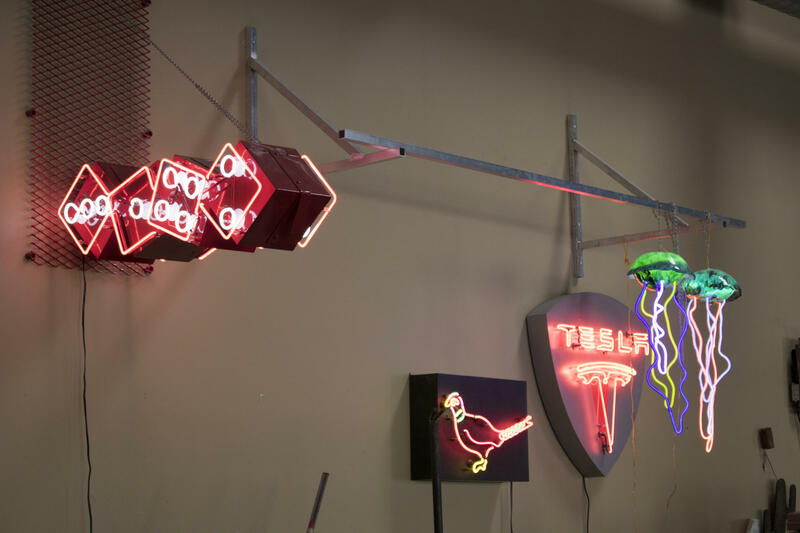 He says a big one was the influx of LED lights, which started by taking over the big bold lettering that neon was known for, as well as the indirect lighting part of the industry, which is about 80% of his work. LED lights use five to ten times less energy than neon and are suitable for locations where neon could be unsafe. But seeing the takeover has still been tough. “When it first started happening, it upset me, but there’s nothing I can do about it,” Hines said. Some of Hines' neon creations at his work space in Reno. He says that neon creates a brand and that people relate that familiar glow with areas like Reno and Vegas. He hopes the craft will continue on. Hines stays busy with new jobs for residences and businesses, along with the always work-heavy season of Burning Man. Last year, he made a huge neon car that stood atop a towering stack of real cars, making his creation visible far and wide on the playa. He says he plans to stay in the business for at least the next decade and that the work load will sustain that. Keep up with Holly’s continued coverage and hear more neon stories through the month of April in Sparked: Northern Nevada’s Neon. What's Happening To Northern Nevada's Neon? Neon and Nevada go hand in hand. The flashing tube lights are synonymous with the Silver State and have long told our story. Neon has surged in popularity at times and fizzled out in others. KUNR's Arts and Culture Reporter Holly Hutchings has been looking into this integral part of Nevada's identity and talked with News Director Michelle Billman about the stories she’s discovered. What's The Role of Motels in Northern Nevada's Housing Crunch? There are more than 100 motels in Reno alone. For some, they’re links to the city’s unique past as a gaming mecca. Others see them as hotbeds of criminal activity that bring down the surrounding area’s economic potential. But as Reno Public Radio’s Paul Boger reports, the motels are increasingly becoming a key player in Northern Nevada’s housing crunch.